Tostones, a traditional side dish made of green plantain, are also known as “Patacones”. There are several ways to add variety to this delicious staple in many Latin American and Caribbean countries – we show you how with crab, avocado, and mango! Fresh lump crab meat 8 Oz. In a medium bowl combine all of the crab meat ingredients and season more if needed. Set aside. Peel plantains and cut into 1-inch slices. 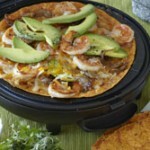 Fill an IMUSA NON-STICK SAUTÉ PAN with about 1⁄2 inch of vegetable oil and bring to heat until it begins to shimmer. In batches, fry both sides of plantain pieces until browned. 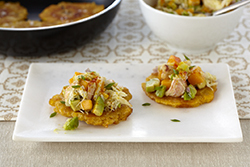 Using an IMUSA TOSTONERA, or a heavy sauce pan, flatten each plantain slice evenly. Re-fry the plantain pieces until golden brown, about 3-4 minutes. Season with salt. 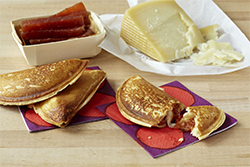 Empanadas are pastries filled with either meat, seafood, or cheese. This recipe includes Guava paste with cream cheese - a classic Cuban combination. It is sweet and flavorful - perfect for breakfast, dessert, or a sweet snack!! 1 package of low fat softened cream cheese 12 Oz. 1 can of guava paste cut into small cubes 16 Oz. Take each empanada disc and place a piece of your guava paste in the middle, then spoon a teaspoon of cream cheese on top. Fold the empanada in half to create a half moon shape. Dip your finger in water and wet the rounded side of your half moon. Using a fork, press on the round part to seal in your filling. Continue to do for the rest of your empanadas. Heat a large non-stick saute pan or caldero and add oil to coat the whole pan. Once heated, add 2 or 3 empanadas, so they fit side by side. Cook on one side until golden brown then flip to do the same on the other. 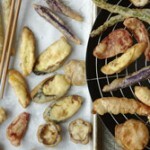 Once the empanada “bubbles” up, place on a platter lined with paper towel to let cool and soak up any excess oil. This is going to be your new favorite side dish. Originating in the Caribbean, this recipe uses coconut milk to give a uniquely sweet flavor to the rice. The beans provide enough protein to the dish to be a stand alone meal, however, it is also delicious accompanied with a flank steak or chicken. 1 can of diced tomatoes 28 Oz. 2 cans of red kidney beans 15.5 Oz. 2 cans Coconut milk 14 Oz. 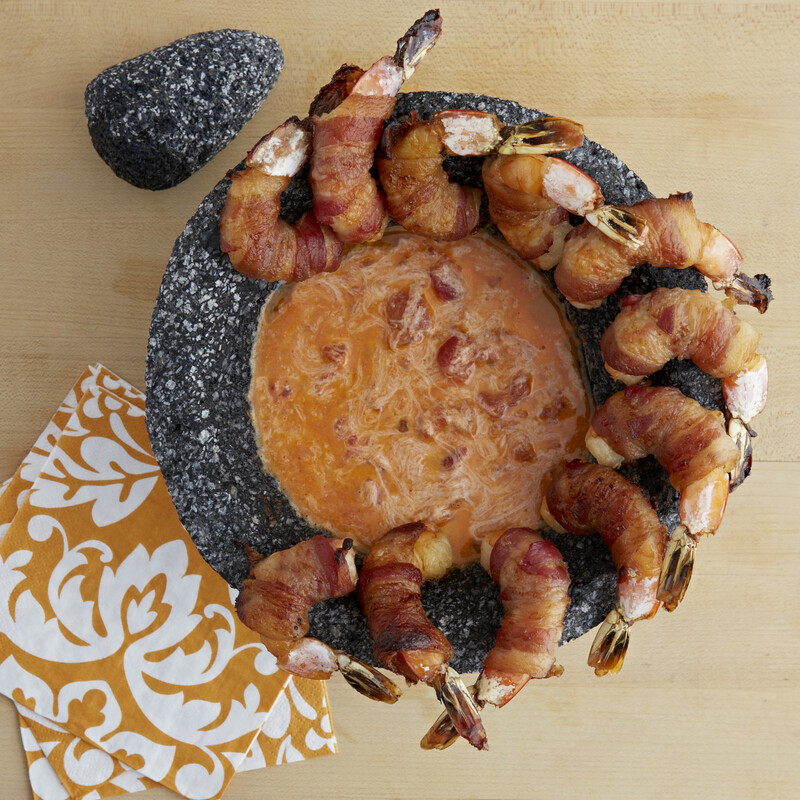 Heat your 6.9 Qt IMUSA Caldero under medium high heat and cook bacon until slightly browned, about 3 minutes. Add onions and garlic and sauté for 5 more minutes. 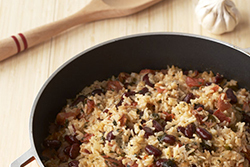 Pour in the drained tomatoes, kidney beans, cilantro, rice and salt and mix gently until well blended. Add the coconut milk and water and mix again. Cover with lid and bring to high heat allowing it to come to a boil. Once boiling, lower the heat and simmer for 35-40 minutes, or until rice is fully cooked. 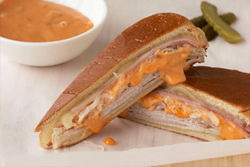 This recipe is a fun take on the traditional Cuban pressed sandwich, adding in a twist with sauerkraut and thousand island dressing! Preheat your IMUSA SANDWICH PRESS. In the meantime cut hotdog buns all the way through until you have two separate pieces. Divide pork evenly on one half of bread. Spread 1⁄2 cup sauerkraut on top of each slice of pork. Evenly disperse the ham and cheese on top of the sauerkraut and top with the bun. Place sandwiches on the IMUSA SANDWICH PRESS and gently press down, making sure that the sandwiches don’t move. Toast for about 3 minutes, or until cheese is fully melted. Remove and open each sandwich and generously spread a spoonful of thousand island dressing. Cut in half with a serrated knife and serve immediately. Nothing heals the soul like a homemade chicken noodle soup! 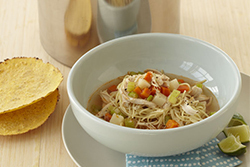 This recipe uses white potatoes and angel hair pasta to make a hearty soup perfect for lunch or dinner. Angel hair pasta 4 oz. Bring 2 quarts of water to a boil in a large IMUSA STOCK POT. Add the chicken breasts, garlic, bay leaf, and salt. Reduce the heat to low, cover the pot, and simmer for at least 1 hour, until the chicken is cooked through and opaque. Transfer the chicken to a plate and set aside. Discard the garlic and bay leaf. Reserve 1⁄2 cup of the hot stock and dissolve the tomato paste. Set aside. Transfer the remaining stock to another container and allow it to cool completely. Heat the olive oil in the same pot used to make the stock. Add the onion, celery, and carrot and sauté for about 5 minutes, until the onion is soft and translucent. Add the potatoes and the tomato paste mixture, and the stock. The stock should cover the vegetables by 3 to 4 inches. If the stock is too low, add more water. Bring the soup to a boil, then reduce the heat to low, cover the pot, and let the soup simmer until the vegetables are soft and tender, about 40 minutes. Remove the chicken from the bone and tear it into pieces with your hands or a knife. Add the chicken and the pasta to the stock and stir to incorporate. Bring the soup to a boil again, consequently, reduce to a simmer for 5 minutes or until the pasta is al dente, stirring it occasionally. Turn off the heat and season. Add a squeeze of lime before serving.